With that being said, something I’ve wanted to do for a while now is review restaurants on the blog. I keep saying I’ll start when we move to Chicago, but after an amazing birthday dinner this past weekend, I came to realize that there’s no time like the present. To be fair, Kacy’s restaurant reviews are what really pushed me to incorporate this into MIS. Even though she lives in a different city and doesn’t follow a 100% vegetarian diet, I really look forward to reading about her foodie adventures. And now when I visit DC, I’ll know exactly where to go! I know these kinds of posts aren’t for everyone. But I absolutely love reading and writing about food, so I hope you’ll join me as I explore new-to-me restaurants and try some [hopefully] delicious dishes! And as always, all opinions will be two things – honest and my own (and sometimes Vishnu’s)! If you’re looking for the kind of meal that will transport you to Italy, look no further than Il Ritorno in downtown St. Petersburg. After walking by this particular restaurant several times, Vishnu and I decided to eat here this past Saturday for my birthday. And I’m so glad we made that decision. This elegant restaurant serves some amazing Italian comfort food – perfect for a celebratory meal. Il Ritorno is a small yet cozy restaurant in the heart of downtown St. Pete. The overall ambiance is romantic but slightly rustic at the same time. The dim lighting, candles and imperfect brick walls give the whole space an edgy yet attractive glow. We loved it! In terms of service, Il Ritorno really delivered. Our waiter was knowledgeable about the menu and made several recommendations based on our personal preferences. He stopped by to ask us how our meal was a few times but otherwise let us be. And he kept our water glasses full (it irritates me when this doesn’t happen!). I could tell that the whole staff strives to deliver a special dining experience for their customers. We started our meal with drinks – a delicious Malbec (Primus Malbec, Mendoza, Agentina) for me and a chocolate stout beer for Vishnu. After perusing the incredibly creative menu for a few minutes, we narrowed down our choices and were ready to order. 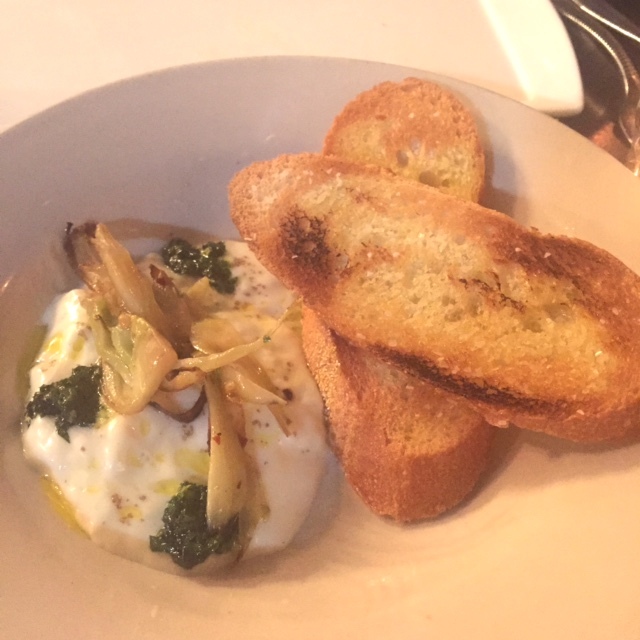 For our appetizer, we decided to go with the Warmed Burrata. This dish was more complex than it sounds, as it was topped with caramelized fennel and citrus oil. The toasted baguette pieces added a buttery/salty element which paired well with the light and creamy texture of the cheese. 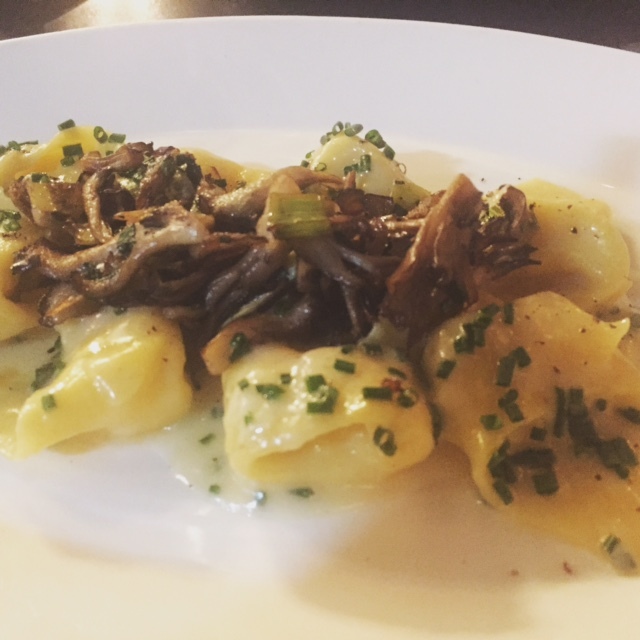 For my main course, I ordered the Tallegio Cappelletti – a ravioli like pasta stuffed with a thick creamy cheese and topped with mushrooms, charred leaks, and black pepper. I found this dish to be satisfying on so many levels! The house made pasta was perfectly al dente. The mushrooms and cheese played well together and added depth to an otherwise simple (yet delicious) dish. 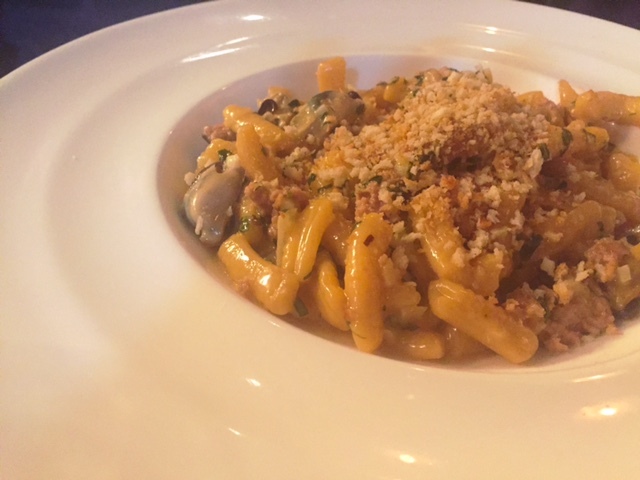 For his main entree, Vishnu also ordered a pasta dish – the Pepper Cavatelli. Obviously, I didn’t try his food, but from what he told me it was very good. There were steamed mussels, caramelized onions, lemon, breadcrumbs, and spicy chili. Vishnu prefers his pasta super well cooked and not al dente, so that was the only aspect he didn’t enjoy. Otherwise, he said the seafood was fresh, the sauce was hearty, and the spice level was on point. And of course, we couldn’t leave without sneaking a peak at the dessert menu. I wasn’t feeling a heavy dessert after all of that pasta and cheese, so instead we opted for the Nutella house gelato. 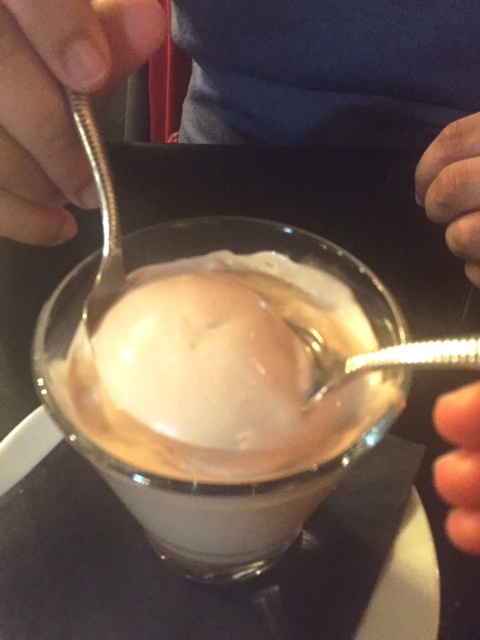 It was incredible and unlike any restaurant ice cream I’ve ever tasted. It had a light, whipped consistency that reminded me of a milkshake! Overall, we really enjoyed our meal at Il Ritorno. The fresh, simple ingredients and innovative flavors were the stars of the show. We look forward to eating another celebratory meal here before we move to Chicago! Do you have a favorite Italian restaurant where you live? I love the idea of you incorporating restaurant reviews into MIS! Maybe it’s just the foodie in me but it’s always nice to hear about the restaurant scene in other cities, regardless if I have any ties to the place or not! This restaurant looks right up my alley- nothing beats a hearty meal at an authentic Italian restaurant. Both yours & Vishnu’s entree looks delicious- I especially love getting seafood-based pastas when eating at Italian restaurants. It’s almost a given it’s going to be good :)! Thanks! I knew my fellow foodies would like this new topic! I went to an Italian place not too long ago.. And it was overall great. It a small, hole in the wall kind of place that does everything homemade and fresh. My friends pasta was delicious compared to mine but i am going back to try another dish. Warm burrata sounds heavenly!!!! Can’t wait to see more restaurant experiences. Bon appetit my friend! Hole in the walls are the BEST! And it the burrata was so good – creamy, buttery, mmmm! Love restaurants where the menu changes every so often. Such a big indicator of freshness…and innovation! Oh my gosh this all looks and sounds incredible! This place sounds right up my alley, and that gelato – OMG! Ohhh favorite italian place is hard!!! There are a couple of spots in Richmond that I really love. Italian is so vegetarian friendly that it’s one of my top requests, haha. I also love reading restaurant reviews. Maybe that’s crazy since I’ll probably never get to go to this place but I still find it so interesting! !